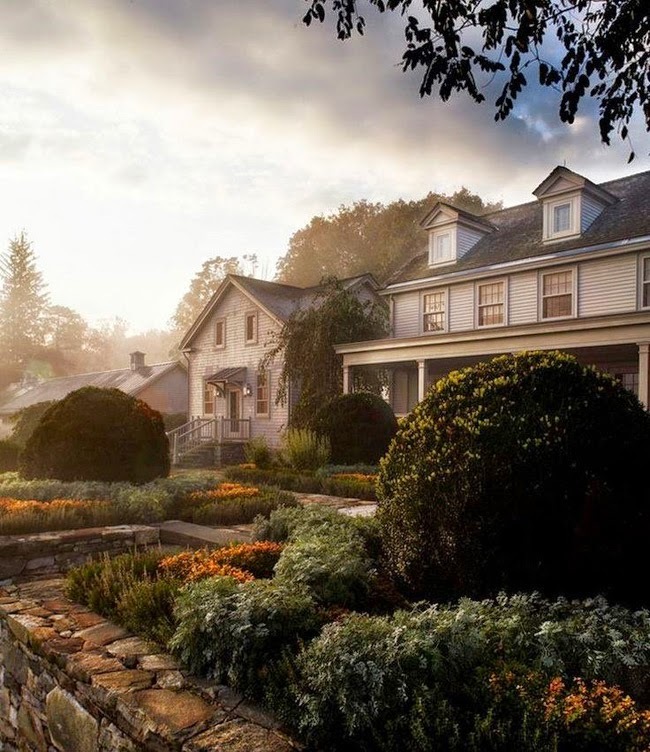 Martha Stewart’s move to Bedford, New York, an upscale hamlet in Westchester County, took place over a period of several years while her new property underwent major renovations. She purchased two contiguous lots (totaling 153-acres) in 2000 and, since then, has been gradually restoring and rebuilding, making new additions and refurbishing existing structures. 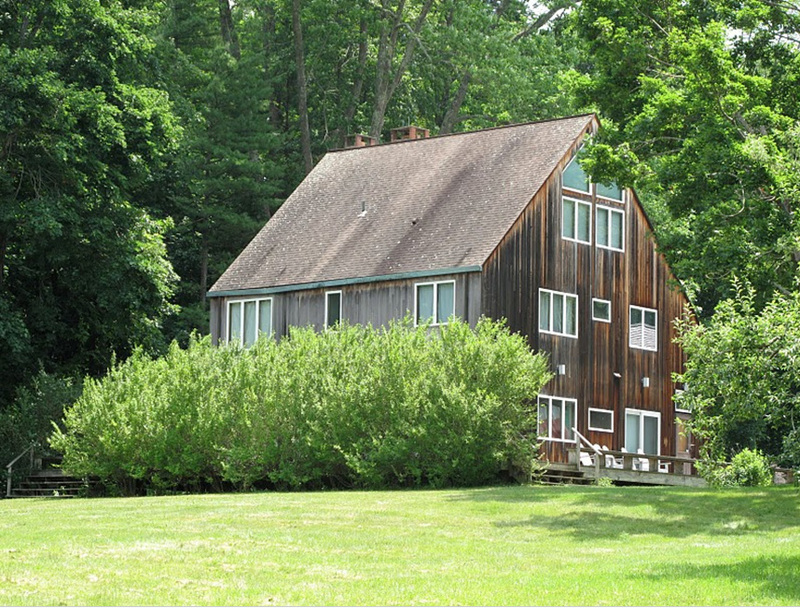 Once called Sycamore Farms, Martha’s property was first settled in 1784 and is known locally, today, as Cantitoe Corners. (Cantitoe was the wife of an Indian chief named Katonah who lived in the region in the 1700s.) It's previous owner, Ruth Sharpe, was an eccentric millionaire who died in 1999 at the age of 95. When her family decided to sell the property, Martha knew it was where she wanted to be. 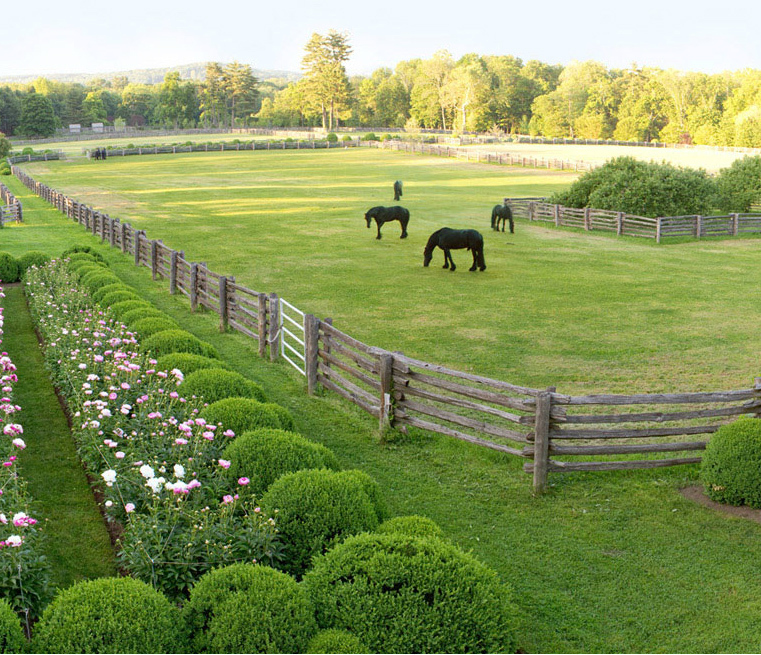 With wide fields and swaying sycamore trees, the property is one of the finest in the region, adjacent to the home of fashion designer Ralph Lauren. Westchester County was once famous for its Republicanism and old money. Today, however, the attitude here is decidedly casual and laid back, home to a roster of celebrities, including Richard Gere, Ryan Reynolds and wife Blake Lively, and Glenn Close. Traditional roots are still intact, however. The 1939 clock tower at Sutton Corners, for instance, is wound by hand each week by the neighbors. Many of the wealthy landowners are farmers, too, tending to their land and livestock in dirty dungarees. Old money still lives on, though: Francis Kellogg still lives in his family’s 18th Century house at Mill Pond, and Robert F. Kennedy lives there with his family, tending to the region’s pollution control and water sanitation regulations. Martha, who adores new projects, snapped up Cantitoe Farm when it went up for sale and she immediately wrote a mission statement for the property, a manifesto of dreams, as it were, outlining all of her desires and plans for what she hopes will be her main residence from now on. Martha is already quite close to achieving this dream. In 2001 she hired famed architect Allan Greenberg to co-design many of the new plans, including new garages, stables, greenhouses and barns, as well as converting a tractor garage into an entertaining room off the kitchen, which are both joined to the main house by a walk-through servery. Martha constructed a large garage and converted an old barn into a building for special projects: it contains a blogging room and a homekeeping studio on the main floor and a gym on the second floor. What never came to fruition, however, was a 4,500 square foot house in the center of the adjacent farm field. Preliminary sketches showed a two-story structure with banks of small-pane windows, similar in style to Shaker architecture, at the end of a long pathway surrounded by wildflowers and hostas. According to an article in the New York Times about the property, Allan Greenberg says Martha envisioned three enormous rooms inside (each approximately 30' x 50') for entertaining large groups. The plans, however, were never approved by the town's counselors and construction never began. The houses that were already on the lot at the time of purchase have been completely rebuilt on their existing foundations. Martha reconfigured the layout of the Winter House to face backwards, so that its front porch looked out over the acreage rather than the road. The exteriors of the houses were done with hand-cut clapboard siding, stained gray. In fact, the entire palette of the property is gray – Bedford Gray, which is now a paint color sold through her Martha Stewart Living paint line at the Home Depot. The color was based on an old piece of Italian stationery that Martha had in her collection. 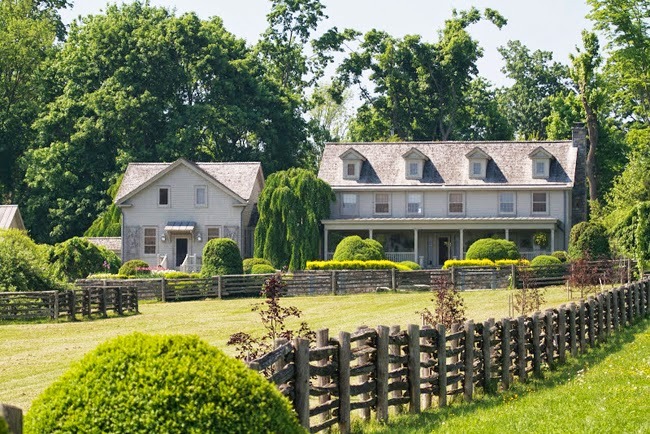 Gray stone stables, gray fencing, gray equipment buildings and gray barns dot the landscape. The interiors have also been re-worked using shades of gray. The main kitchen in the Winter House is comprised of dyed-gray sycamore veneer cabinetry with gray lacquer trim. The cabinets and shelving were designed by architect Beth Weinstein and built by Bjork Carle Woodworking in Brooklyn. The white and gray floor was cut from stone taken from the Gordon Bunshaft house Martha once owned on Long Island. The overall effect is of serenity and monochromatic harmony. To see the interiors of the Winter House, click here. Outdoors, she has had four miles of carriage roadways built on the property and she imported 100-year-old white cedar paddock fencing from Canada to create grazing paddocks for her five Friesen horses, also from Canada. Courtyards on the property are paved with cobblestones that once lined the streets of Elizabeth, New Jersey (Martha's home state) and were originally used as ballast on old wooden cargo ships. 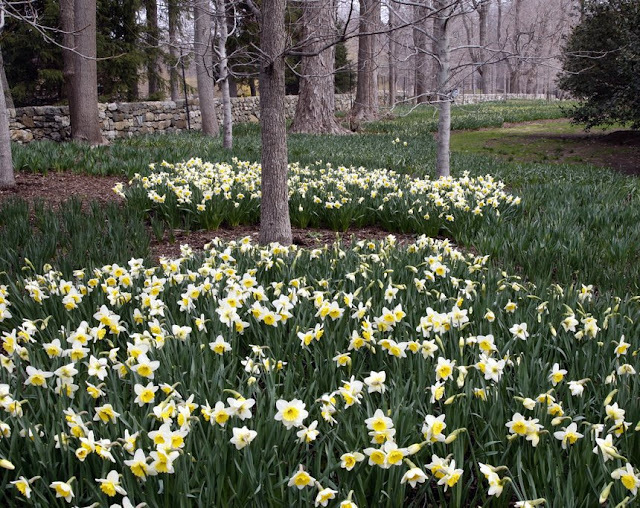 There are more than 45,000 daffodil bulbs planted along the rock walls that line the property (45 different varieties) and nearly 5000 new trees have been planted since her arrival, including lilac, pin-oak and linden allées. Japanese maple groves and a pinetum were also planted. 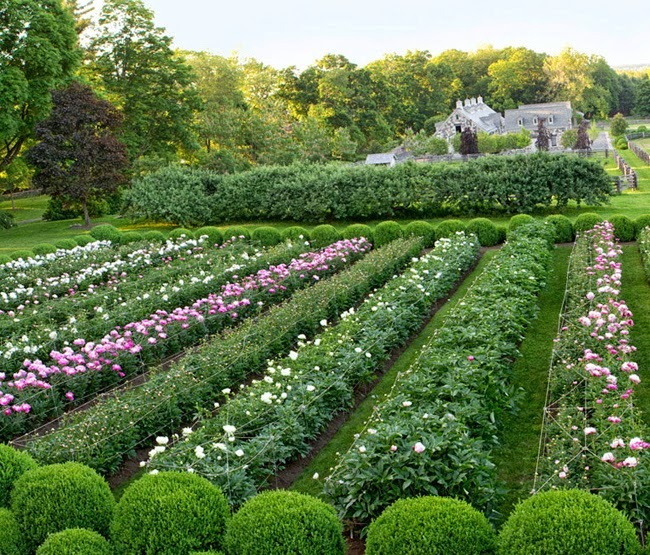 There is a peony garden boasting 200 different plants and a 'boxwood room' next to the Summer House. Martha in the stables with her horses and donkeys, all from Canada. The stables were designed and built by Allan Greenberg's firm with interiors designed and built by a British company called Loddon. Martha's Friesen horses grazing outdoors. To keep their coats shiny and black, Martha rarely lets them out during the height of sunny summer days, since sunlight can turn their coats a reddish hue. Early mornings and evenings are the times you'll most likely see the horses outside. The entrance to the stables. 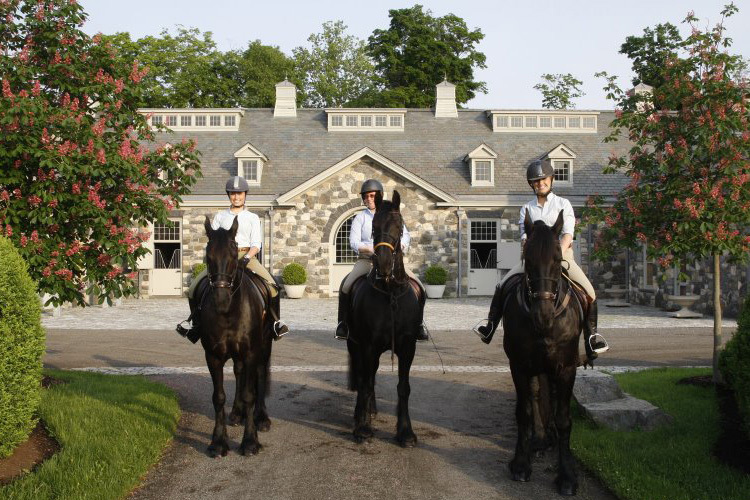 The stone used to build the stables was quarried in Vermont. The greenhouse where Martha keeps her collection of tropical plants was designed and built by Allan Greenberg's firm, based on the designs of Crystal Palace, a large cast-iron and plate-glass Victorian greenhouse built in Hyde Park, London. Behind the greenhouse is the enormous vegetable garden. Today, the garden has been converted to Martha's cutting garden and the vegetable garden has moved closer to the chicken coops. 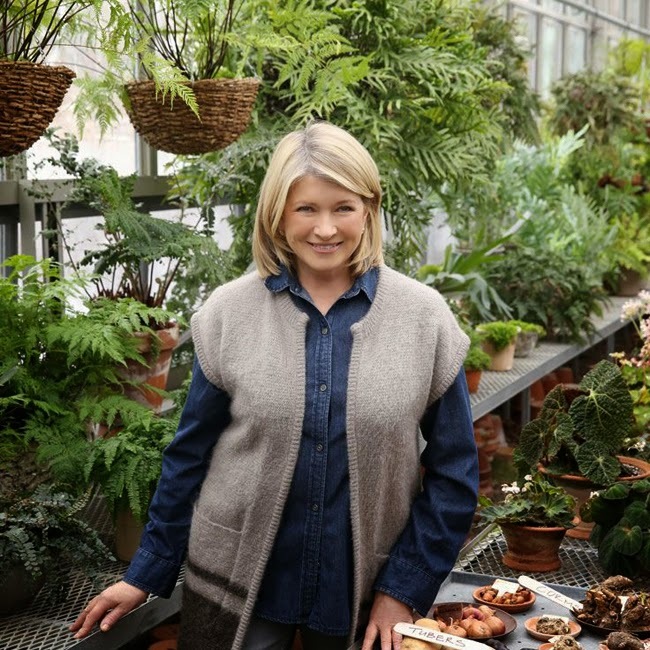 Martha displays her tropical plants during the summer months in the sunken garden, which connects the main Winter House to the Summer House. The entrance to the Summer House. The tenant cottage in the spring. The contemporary house on the property. It is the only building that Martha has not yet renovated. The formal parterre, leading up to the porch of the Winter House. What utility do the Friesians serve? By any chance, are they, or any of them, ever driven? How very smart Ms. Stewart would look, wearing a luscious hat to complement her garb, seated on a carriage! I wonder if Ms. Stewart feels guilty whenever she treads all over this flooring. Martha actually fought to save the Bunshaft house, which was not destroyed by her but by the new owners. The house was sold by her daughter, Alexis, to a new couple who have since demolished it. Before they could, Martha took the floor for the Bedford house to save at least a part of it. I'm sure what she feels is not guilt, but happiness that she had the foresight to save some of its history before it was torn down by the new owners. True enough. The list of those complicit in the tragedy includes others, not just Ms. Stewart. The new owner it seems couldn't be bothered to try and fix the mess left, but consider that Ms. Stewart gutted the interior to refit it completely, an act of total disregard for Gordon Bunshaft's work, and an act of gutting that ultimately left the building to fall apart. The architect hired to do his was someone whose work I admire and appreciate greatly, the architect John Pawson. However, he has shown a certain arrogant streak in several projects, and in his written works; to agree to totally replace the interior designs of another important architect really sums it up. The fact that Ms. Stewart hired him when the 'minimalist' movement had become such a vogue statement maybe says more about her appreciation for the _trend_, than for the particular architectural merit of the style itself. MoMA willingly sold it to Ms. Stewart, with the knowledge of what she preferred and may do to the building, so they're not past remonstration either. We wouldn't gut and refit the interiors of Falling Water or the Farnsworth House, no matter what we thought of the architecture itself. Uh, I'm not joining the argument here, I'd just like to know where I can find more photos of Cantitoe Coners! I've seen the kitchen in her magazine and the various rooms, like the craft room and stables, but I can't find any pics of the exterior of the house itself, or of the restoration she did to the houses already on the property. Perhaps Andrew can post some of those if he has them, or point me in the right direction? I'm just fascinated by her Bedford estate because, if I'm not mistaken, it's the first home she has designed and built from the ground up. Has she published the house plans for it? You can find quite a few photos of Cantitoe Corners on martha's blog: http://blogs1.marthastewart.com under the "MY HOME" link. You can also see full articles on Martha's basement, Martha's craft room and her vegetable garden in past issues of "Living." Check the magazine periodically, if you don't subscribe, for articles. Martha did not really design the houses, so much as redesign them. The houses are original to the property, which dates back to the 1700s, but Martha tore them down and rebuilt them with new materials to spec, changing the houses so that they faced the farmland instead of the street. She collaborated with Allan Greenberg to build on to the original main house (1925 Winter House) with a 4000 square foot addition that includes the kitchen and a large room for entertaining. The Summer House is used primarily as Martha's library and guest house. There is a tenant's cottage next to the main house, too, where Alexis stays when she visits. The plans for the three main houses on the property have not been released to the public. We live not far from Bedford, I'd love to drive past Martha's farm, do you know on which road it is located? thanks! Yes, it's on Girdle Ridge Road. Take a snap for me! Today-the town of Bedford NY is behaving like children...Qaddafis tent on Trumps property is being attacked by zoning-Imagine what your next 'wedding' tent construction is going to go like. Is Martha ever planning on releasing the house plans to the public? If so when? I absolutely adore her house, and would love to have a similar one. A complete map of the entire property would be incredible too- Martha is so amazing, even a small version of her property would be a dream come true. Hello, can you tell me what kind of trees you have lining the drive at Cantitioe Corners. I have a 300 foot drive on an old farm and was wanting to plant trees to line the drive. Hi Lynn, They are lindens. I admit to shamelessly ogling Martha's horse stables when running on Maple/Reservoir Rd. I have perfected the art of running straight while looking straight off to the side! Does anyone know who designed and made the kitchen cabinets? Hi, The cabinets were designed by architect Beth Weinstein and they were constructed by Bruce Bjork of Bjork Carle Woodworking in Brooklyn. I would love to know how many staff are required to run a farm of this size? How many gardeners, horse staff, and house staff? Martha does all the work herself !!! I really hope Marthe will employ an English or Dutch garden designer to make the most of her landscape!